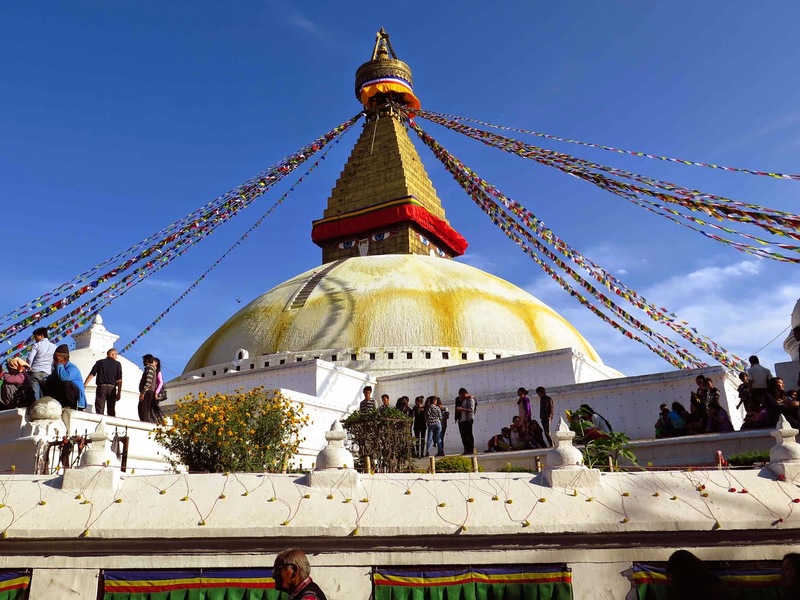 Jackie's Nepal Blog and Other Wanderings: Back in the US of A and am I ready for it? Wow! What happened? I feel like I have been slingshotted back to the future but not really. Going from the US, with all it’s modernity, to Nepal, which is coming of age in some ways, back to the US, can really do a number on the body (via jet-lag) and the psyche. Does that make sense? I know it doesn’t. But overall, the transition back has been going well and thankfully, it really started when I was back in Nepal. After leaving the hustle and bustle of Thamel, the tourist district of Kathmandu, I shifted (that’s the word they use there in Nepal to indicate a move, and I like it) to the Boudha neighborhood about 30 minutes to the west. It was like I had moved to an oasis of quiet amid an ocean of sound. Situated next to one of many monasteries in the area and in the shadow of Boudhanath Stupa (one of the largest stupas in Asia), the guest house was a welcomed change. I met travelers who had spent months studying Buddhism and meditation at the neighboring monastery and I met newly arrived travelers who had yet to shed the anxiety they were unable to leave behind. My pace slowed down in Boudha. However, that’s relative because the pace is never fast to begin with. Everything feels slower, but mainly it’s the movement of people that’s slower. Traffic is slower, walking is slower. As a result of this slowing down of movement, it feels like one can see more. See more of each other and become a part of the movement rather than one trying to beat it. And with this slowing down, I rode on the back of some of my friends' motorbikes. I would never do that here in the states! No way! But there, I did and it was exhilarating. Not because we were going fast (because we sure weren’t! ), but because it felt like I became a part of the city and its people. Many get around on motorbikes or scooters. It’s an easy way to navigate around the bigger vehicles. Husbands and wives with a baby or child sandwiched between them were a common sight! I felt like I became a part of that fabric of life. It was one of many amazing and of course, fun, experiences! So here I am back in the US. Everything is orderly. No honkings, no dogs barking, no traffic (except during rush hour), no uncontrolled exhaust blowing in your face. Interestingly enough, it feels slower than I remembered it to be. I feel like I am in a different kind of oasis, one in a sea of order. This is neither good nor bad. It just is. And although I was sad to leave Nepal, I am home. This is my reality and I'm ready for it. Now it’s time to get on with things here and continue to support the work we do there in Nepal. I’ll just have to remember to not rush, to be slow, and continue to be grateful. Thank-you for being a part of this journey. A journey of a lifetime. Dherai dhanyabaad and Namaste.